Had enough surf and sun on your Tamarindo vacation? Ok, maybe that is impossible, but take our advice and ditch the beach for a day and head to the river for some wet and wild action whitewater rafting in Costa Rica. Tamarindo whitewater rafting tours offers some fun and exciting river rafting adventures in Guanacase for you to choose from. You are staying in Tamarindo, so most likely you have already planned on participating in one of Costa Rica's top activities, surfing in Tamarindo; but did you know that Costa Rica is also world-famous for its incredible whitewater rafting tours? Any given weekend you can see a group of locals pack up their rafts and paddles and head to one of the nearby rivers seeking a thrilling day of whitewater rafting. Join one of our Tamarindo Whitewater Rafting tours and see for yourself why Costa Ricans love river rafting. 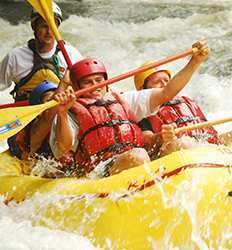 The Guanacaste regions has a couple of river rafting tours to choose from. The Tenorio River emerges from the Tenorio Volcano and Guanacaste mountain range cascading down creating class II/IV rapids. 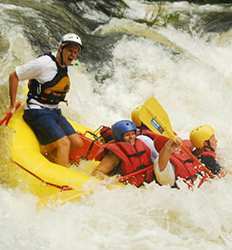 Its roaring rapids make Rafting Tenorio River some of the best river rafting in Guanacaste. You can also take it up a notch by adding some true canyoning to your river rafting experience. The Real Deal Tours offer you the quintessential Costa Rica tour combo; whitewater rafting the Rio Colorado finishing with a rappel down the famous waterfall with which it shares its name. Incredible! Take our word for it when we say we don't want you to miss out on this incredible experience in Costa Rica. Choose your Tamarindo whitewater rafting adventure below! Whether you are an experienced rafter or a first timer, if you are looking to put your skills to the test and see what you´re really made of, look no further than the world famous Class 3 and 4 rapids of the Tenorio River. This 10 mile stretch of whitewater rapids with twists and turns throughout the Guanacaste mountain range will test even the most courageous paddlers among us.